Venom is one of Spider-Man’s greatest and scariest enemies. He possesses all of Spidey’s powers, and none of the responsibility. With Sony’s Venom hitting theaters this weekend (and it being Halloween month), we’re going to take a look at one of Spidey’s scarier rogues. Note to self: avoid self-making costumes. Venom has a very intricate backstory. The look that Venom traditionally sports was actually intended as a new costume for Spidey, making its debut in The Amazing Spider-Man vol. 1 #252 (1984). However, chronologically, it first appeared in the pages of Marvel Super Heroes Secret Wars #8 (1984). 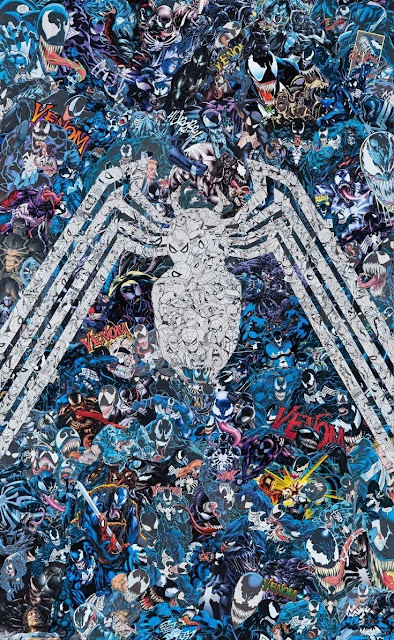 Secret Wars was the first large-scale crossover in comics that saw a group of various heroes and villains whisked away to an alien planet to do battle. There, Spidey, using what he thought was a costume-repairing machine, actually housed a living entity known as a Symbiote. It bonded with Spidey and created his new black costume designed by artist Mike Zeck. The idea for Spidey’s new look came from reader Randy Scheuller, who had submitted it as part of a competition for aspiring writers and artists. Then-editor-in-chief Jim Shooter liked the idea and bought it from Randy for $220. The idea for the suit to be a biological material that could self-heal was one abandoned by John Byrne during his run on Iron Fist, but used by Roger Stern when he plotted Amazing #252. 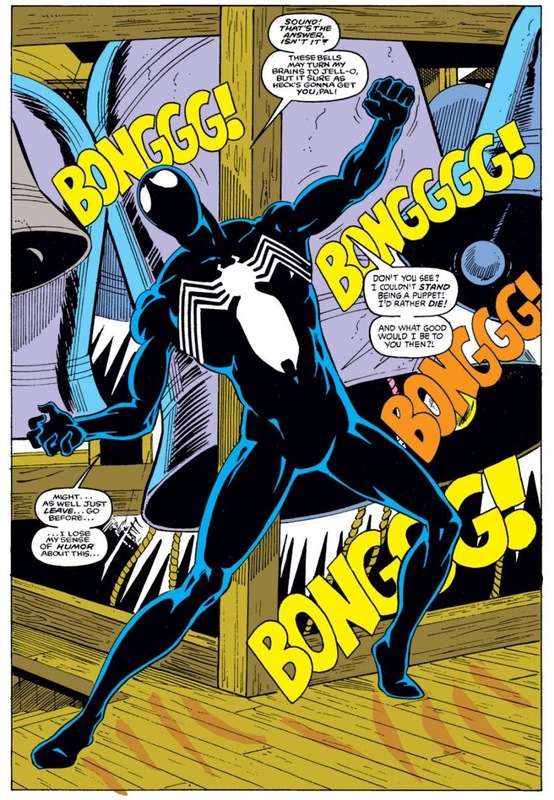 After Stern left the book, writer Tom DeFalco and artist Ron Frenz were the ones who established it as a sentient being vulnerable to fire and high sonic energy. Learning the nature of his costume, Spidey used a church bell to remove it from his body in Web of Spider-Man vol. 1 #1 (1985). Mary Jane gets an unwelcome guest. That wasn’t the end of the story. Over the next year, Spidey would find himself the target of a stalker that wouldn’t set off his spider-sense. The creature that would become known as Venom would make a cameo in The Amazing Spider-Man vol. 1 #299 (1988) terrorizing Spidey’s wife, Mary Jane Watson, before making his first full appearance in #300 by David Michelinie and Todd McFarlane. It turned out that reporter Eddie Brock had misreported the identity of serial-killer Sin-Eater on the word of a chronic confessor, resulting in his disgrace in the industry and being banished to the pages of the tabloids after Spidey captured the real one. His depression took him to the very church where Spidey freed himself of the Symbiote, causing it to be drawn by their mutual hatred of Spidey and bonding together. Because of the Symbiote’s earlier bond to Spidey, Brock had gained access to all of Spidey’s memories, all of his powers, and the ability to evade detection by his spider-sense. The character proved immensely popular, appearing several more times as a villain in Spidey comics before turning into an anti-hero and getting a number of books of his own. Over the years, the Venom symbiote has changed hands. For a time, former Scorpion Mac Gargan became the new Venom. 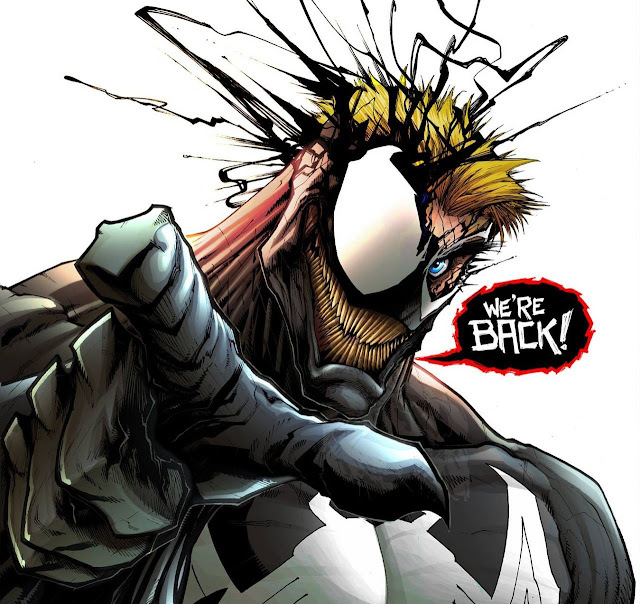 Later, the Symbiote was bonded with Spidey friend Flash Thompson, turning him into Agent Venom. The Symbiote was also briefly joined with gang member Lee Price before ultimately returning to Brock and resuming his career as an anti-hero with villainous tendencies. 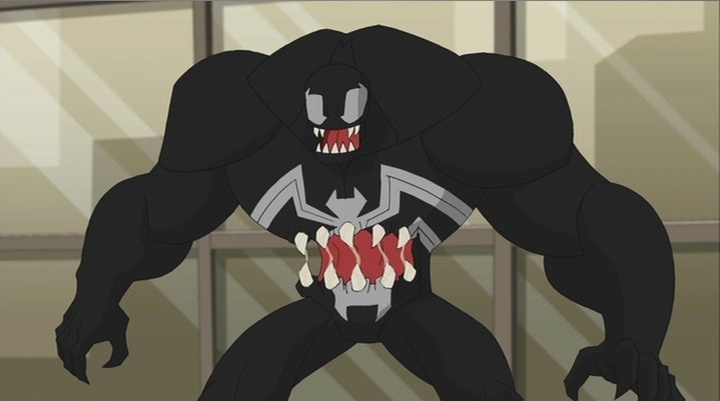 While Venom had appeared in toys and video games since his creation, his first time being adapted to other media was in Spider-Man: The Animated Series. After Spidey (Christopher Daniel Barnes) rescued John Jameson (Michael Horton) and his crew from a downed space shuttle, he found himself covered in a black goo that turned out to be the Symbiote. In this version, Eddie Brock’s (Hank Azaria) fall from grace came when he teamed-up with Norman Osborn (Neil Ross) and Spencer Smythe (Edward Mulhare) to capture and unmask Spidey, but ended up with Flash Thompson who was pulling a prank in a Spidey costume instead. Brock’s second fall from grace came when he attempted to accuse Spidey of robbing the space shuttle, leaving out the involvement of Rhino (Don Stark). After Spidey rejected the Symbiote, it found Brock and they became Venom in order to achieve mutual vengeance against him. His next appearance was in Spider-Man Unlimited. 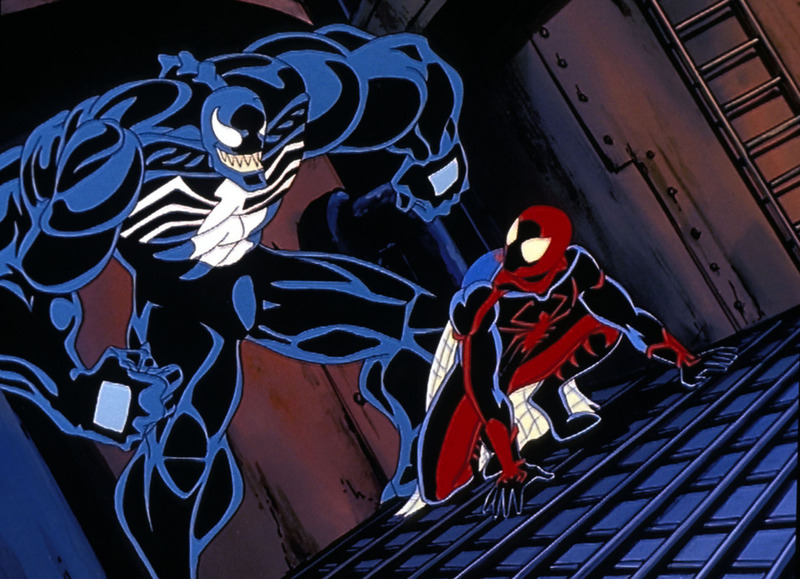 Venom (Brian Drummond) and his adversarial offspring, Carnage (Michael Donovan), hitched a ride on John Jameson’s (John Payne) space shuttle to follow a compulsion to journey to Counter-Earth: an exact duplicate of Earth on the other side of the son. Fully bonded to their respective Symbiotes, the pair attempt to help conquer that world for the Synoptic, a hive-minded legion of Symbiotes. One can never have too many mouths. 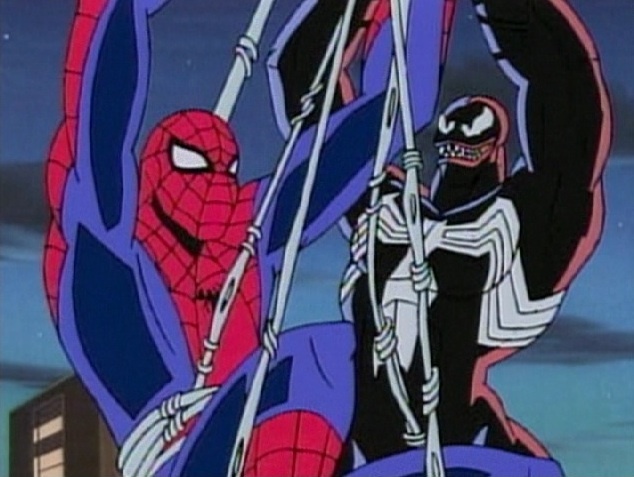 The Spectacular Spider-Man had Eddie Brock (Benjamin Diskin) be deeply connected to Peter Parker (Josh Keaton). Both orphaned, the boys grew up together but Brock was secretly jealous that Peter had his relatives to look after him. 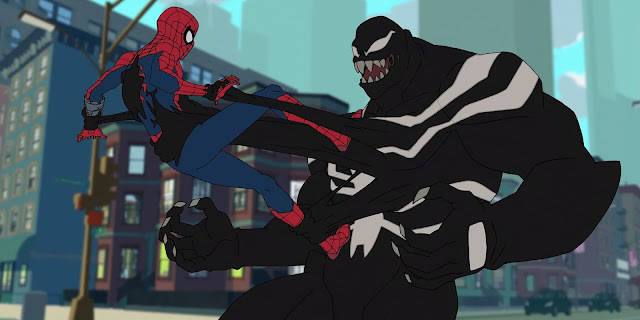 A series of misunderstandings causes a rift to grow between the boys, but the final straw came when Spidey bonded with the Symbiote being studied by Dr. Curt Connors (Dee Bradley Baker). Without the Symbiote, the lab lost its funding and Brock his job. 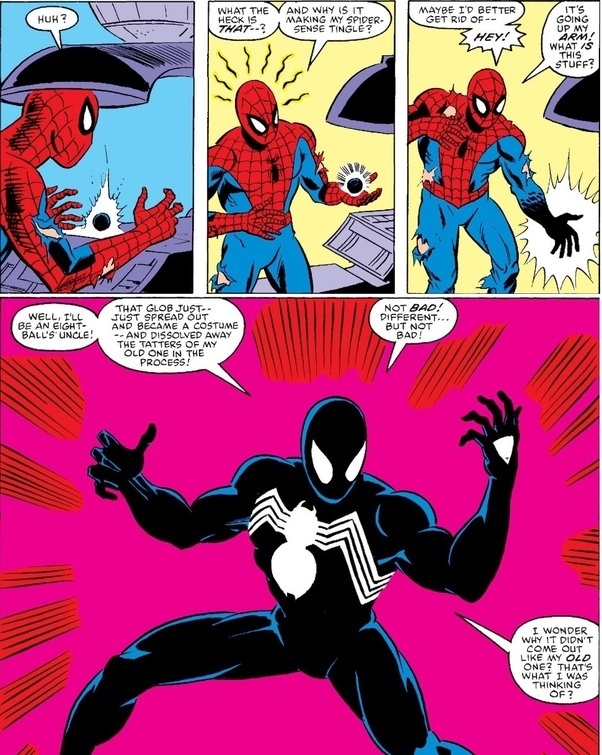 When Spidey tried to get free of and destroy the Symbiote, it unleashed Brock’s animosity towards both Spidey and Peter and drew the Symbiote to bond with him and become Venom. Venom continued to appear in various forms throughout subsequent animated Marvel shows, but returned to Saturdays with Marvel’s Spider-Man. The show found the Symbiote being an unknown substance labeled V-252 from the space program that was donated to Horizon High for study. Using it in a project sees Spidey (Robbie Daymond) become bonded to the substance, making him more powerful. However, upon realizing it also made him more aggressive, he separated himself from it and the V-252 eventually wound up in the “safe” hands of the Avengers’ lab. The V-252 escaped and bonded with Flash Thompson (Diskin), before eventually finding its way to Eddie Brock (Ben Pronsky), who was jealous of Peter outdoing him in obtaining footage of Spidey’s latest battle.